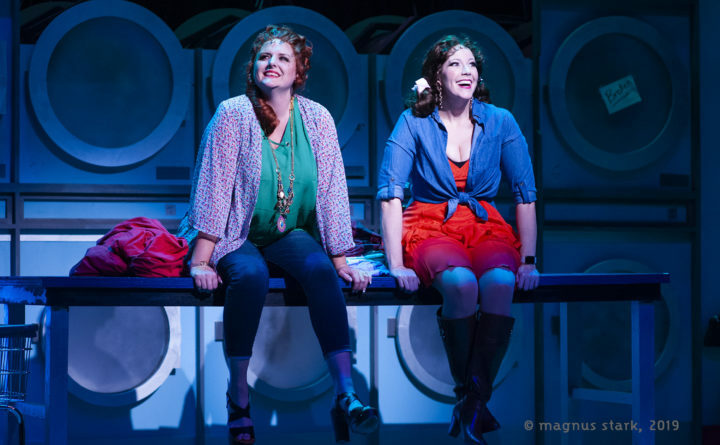 Heather Astbury-Libby as Lana Mae (left) and Laura Hodos as Katie star in Penobscot Theater Company's production of "Honky Tonk Laundry" at the Bangor Opera House. Mainers love country music and the Pine Tree State is home to singers talented enough to give joyous and gut-wrenching interpretations of the best of the genre. So why does the Penobscot Theatre Company insist on turning to the insipid work of Roger Bean and similar jukebox playwrights to showcase this beloved music? Director Dominick Varney, who last year directed Bean’s “The Marvelous Wonderettes: Dream On” for Winterport Open Stage, wrings every hokey, cornpone moment out of the thin story. But what he excels at, in this musical production and others, is getting the women onstage to sing their hearts out. Varney, who also choreographed the two-woman show, uses all of Tricia A. Hobbs’ set, the Wishy-Washy Washateria, well and has his actresses keep moving, which almost, but not quite, prevents the production from dragging. Stars Heather Astbury-Libby of Brewer and Laura Hodos of Orlando, Florida, give great performances. Astbury-Libby, as neglected wife Lana Mae, is equally good at belting out the hurt feelings exposed in Chely Wright’s “Jezebel” as she is at the sweet sentimentality woven into Terri Clark’s “Smile.” As she’s proven time and again in “The Wonderettes” and other musicals, there’s not a popular song genre Astbury-Libby can’t sing. 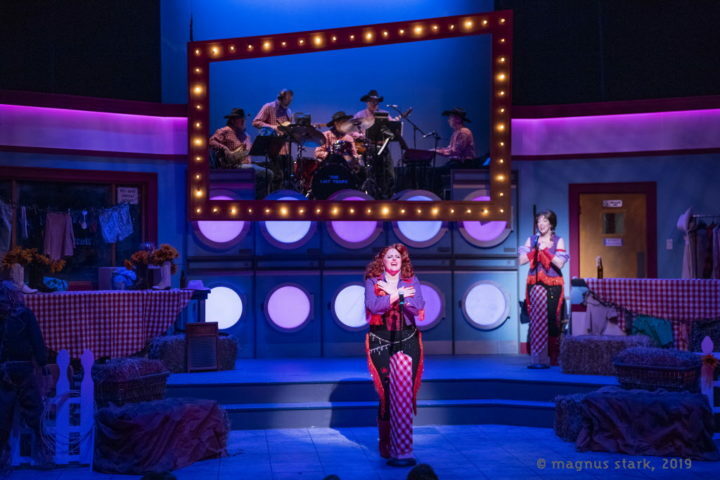 Heather Astbury-Libby as Lana Mae (center) stars in Penobscot Theater Company's production of "Honky Tonk Laundry" at the Bangor Opera House. According to her website, Hodos has created seven solo cabaret productions. Surely, given the opportunity, she and Varney could have put together a better show than Bean did. Hobbs’ dingy laundromat set, complete with rotating washers and dryers and large tables for folding clothes, looks like every neighborhood laundromat that needs a coat of paint and a big bottle of bleach. Lighting designer Scout Hough uses it well, colorfully lighting the washers and dryers from behind their round windows so that they resemble spotlights. “Honky Tonk Laundry” is mostly harmless entertainment, but the show ends on a sour note with a sing-along to the Dixie Chicks’ 1999 hit song “Goodbye Earl.” Considering that half the homicides in Maine last year were related to domestic violence, closing the show with a song about payback for a man beating his wife is in bad taste and sheds no light on one of the state’s deepest and darkest secrets. Nothing in the script hints that Lana Mae is physically or emotionally abused by her cheating husband Earl, so why sing the song? As PTC’s Producing Artistic Director Bari Newport considers shows for next season, she needs to select productions more like “The Fabulous Lipitones,” which showcased the music of barbershop quartets and had an insightfully funny script, rather than another jukebox musical featuring great songs with a macramed script loosely tying them together. Penobscot Theatre Company’s “Honky Tonk Laundry” runs through Feb. 24 at the Bangor Opera House, 131 Main St., Bangor. For information call, 942-3333 or visit penobscottheatre.org. Correction: A previous version of this story misspelled Dominick Varney’s name.